Feeling a little peckish? Longing for a dining experience that transcends the ordinary, taking your taste buds on an otherworldly journey into hot damnnnn territory? Fret not, foodies, for the act of eating can be easily elevated to that of a culinary adventure when good food melds with even greater digs. Tantalizing our taste buds traditionally begins with fresh ingredients, masterful preparation and an aesthetically pleasing arrangement, but once the extra ingredient of architectural genius is added to the mix, a perfectly satisfying meal becomes that of an event that lingers within our minds long after we unceremoniously lap up the last scrumptious crumb from plates. (Waste not, want not…mom would definitely approve.) 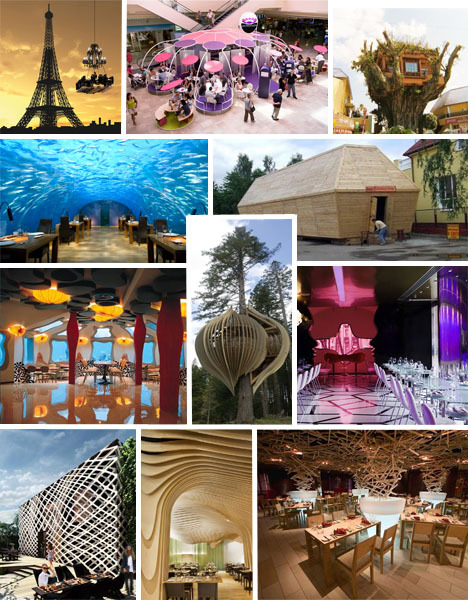 You might want to make a point of visiting at least one or two of the following radically designed chow palaces for an experience you’ll undoubtedly dine for! 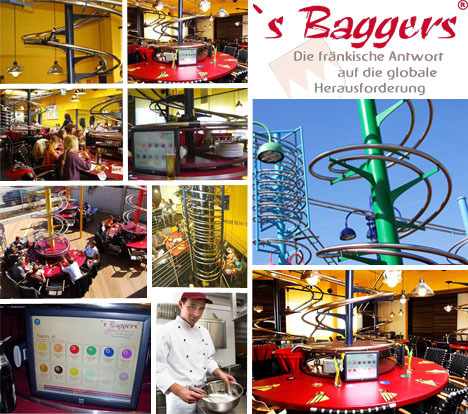 Boasting a Wallace and Gromit-like, spiral-configured and entirely automated gravity feed rail system, Michael Mack is the brainchild behind ’s Baggers highly entertaining and quite efficient automated ordering and direct-to-table delivery service. 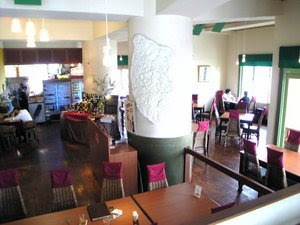 Essentially rendering waiters and waitresses obsolete, his patented, computer-networked process could enable other restaurateurs to focus on the business of serving good food and pass their saved personnel costs onto patrons. Endowing diners with greater control over the pace of their meals, the novelty aspect alone is enough to help Mack gain a devoted following and court fast food chains like McDonald’s, which he is very eager to license the idea to. 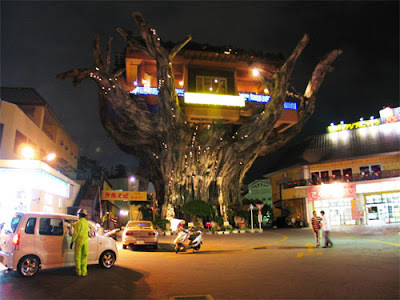 Upon initial review, this novelty restaurant perched atop a rustic looking tree is quite impressive with its 20 foot tall weathered foundation and internal elevator which transports patrons up to the main dining area. The hearty vines ensconcing the trunk add to the overall impression that this is a tree with a storied life, but in actuality, it possesses the heart and soul of plain old concrete. 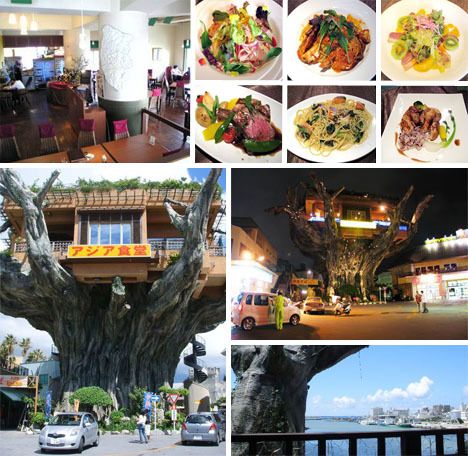 In spite of that buzz kill, the Naha Harbor Diner has earned a reputation as offering an outstanding view of Onoyama Park and the harbor as well as serving up really tasty, locally sourced organic ethnic cuisine running the gamut from Japanese and Indian to Italian. For those who never quite got their sea legs down pat but still long for the hypnotic views that only the ocean can provide will undoubtedly be enamored with the Maldivian spectacle known as Ithaa, which in the region’s native tongue means “pearl”. Indeed, the $5 million restaurant is an ocean bound treasure, located 15 feet below the Indian Ocean to be precise, but you better be prepared to sell off any spare gold dental fillings you might have or at least a whole bunch of platelets to afford their $120 lunch or $250 dinner. Still, some might feel that it’s an experience well worth the bank account damage. 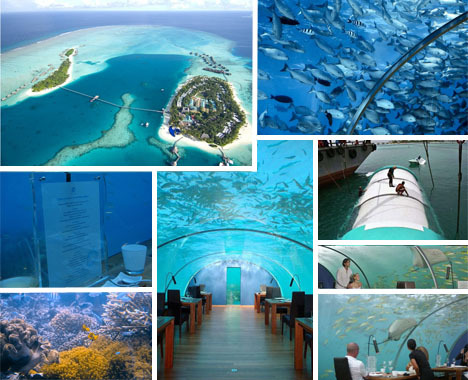 Situated on Rangali Island, Ithaa restaurant is believed to be a one-of-a-kind underwater restaurant encapsulated entirely in very thick clear, aquarium style R-Cast acrylic, enabling patrons to enjoy 270 degree views of coral reefs and the naturally indigenous marine life. In a land dotted with endlessly quaint outdoor cafes, French designer Matali Crasset conceived of a vibrant indoor eating configuration that offers a modern interpretation of an archipelago with multiple satellite dining zones. Located inside a shopping mall at Cab 3000, St Laurent du Var, this Nouveau cafe design concept offers a dash of eye candy as well as a festive indoor solution to the open air dining culture that is so intrinsically a part of the French lifestyle. Even better, the designer created a fully movable unit which can be easily relocated to future locations that may be more optimal. 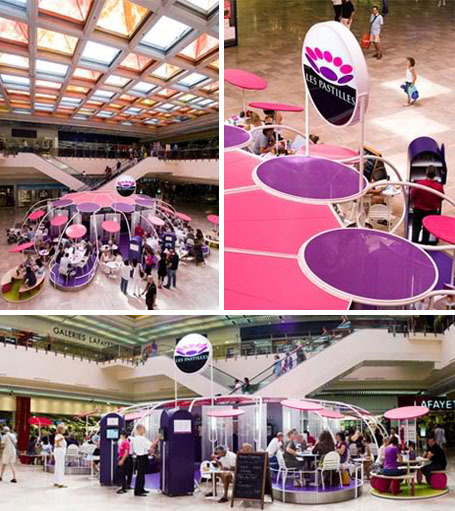 Have you heard what all the buzz is about in Shenzhen, China? 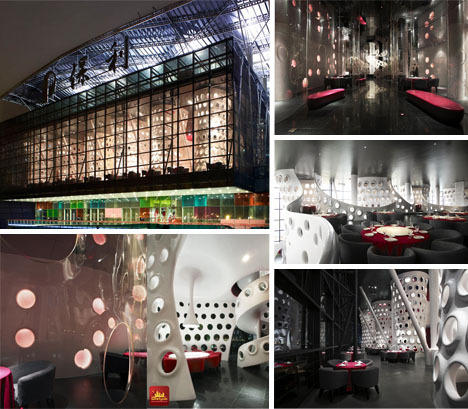 Ever since SAKO Architects constructed the 1300 square meter Honeycomb restaurant, area residents have been enjoying its large public space for special events as well as its intimate dinner nooks, all stylistically divided with a white spiral honeycomb-studded staircase. Featuring sleek transparent acrylic plastic partitions, undulating wave-like white aerated room sectionals, black granite flooring and mirror-like ceilings, the contrast of carefully appointed details with a space-age undercurrent work harmoniously to create a dynamic dining space that any diligent worker bee would happily want to cool their heels off in. Better not be afraid of heights if you step on board the swinging platform of Dinner in the Sky’s instant movable restaurant with a view. Hatched up by an apparently wacky and thrill-seeking Belgium company, they seem to be doing quite well given the fact that they are offering their distinctive crane-hoisted experience in major cities around the globe, including directly above the Grand Canyon, Paris’ Notre Dame, the Las Vegas Strip and naturally, glitzy Dubai. 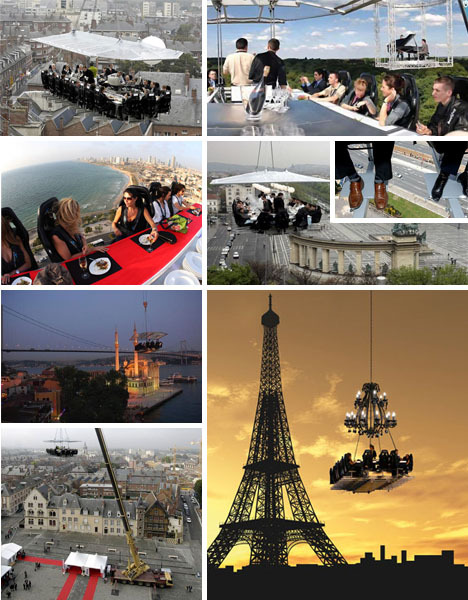 For the equivalent of an average blue collar salary ($30,000), you too can achieve new heights of dining glory with (hopefully) 22 of your closest seriously seat-buckled friends as you clink glasses at a height of 162 feet for two ever-so-brief yet undoubtedly memorable hours. Mangia! A Ukrainian undertaker and funeral home director must have thought to himself, “Egads! I know what’s been missing from the dining scene for far too long…a little dash of death to help us digest the bitter pill of our mortality! 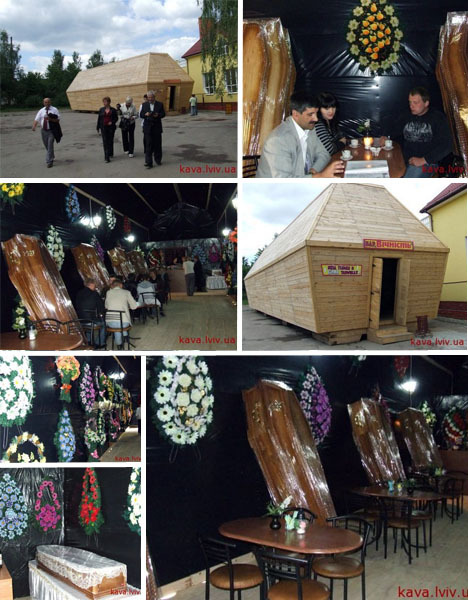 !” In keeping with his whopper of a brainstorm, the enterprising entrepreneur created a massive pine coffin restaurant replica called Eternity — acknowledged by the Guinness Book of World Records as being the largest in the world — and adhered to dreary thematic touches such as funeral music, depressingly crummy carnation wreaths and multiple human-sized coffins propped up against the black landscape plastic-lined walls. Whoo-eee, that’s one heavy scene. 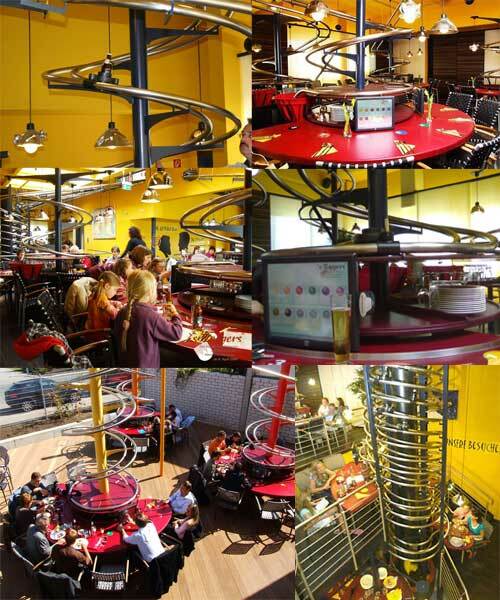 Who’s craving a Hello Kitty eatery instead? 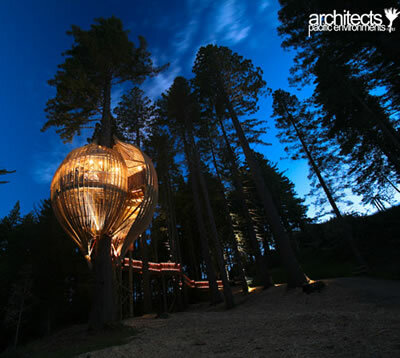 Standing 12 feet tall and spanning an equally impressive 10 feet in width, New Zealand’s plantation poplar-constructed Yellow Treehouse restaurant – nestled on the forest edge and accessible via a meandering 60 meter pathway – accommodates 18 diners in seriously lofty style. 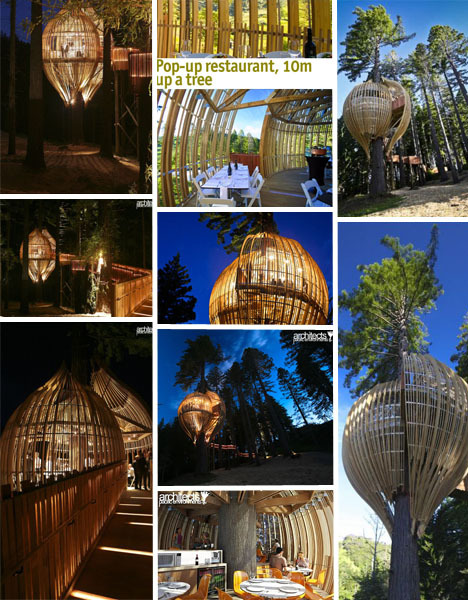 With its chrysalis-like vibe that spirals upward toward an open ended top, the organic design employs structural timber trusses which work in tandem with its central Redwood tree base to support the entire restaurant. Overall, the final look is one of an enchanting childhood fantasy come to life. 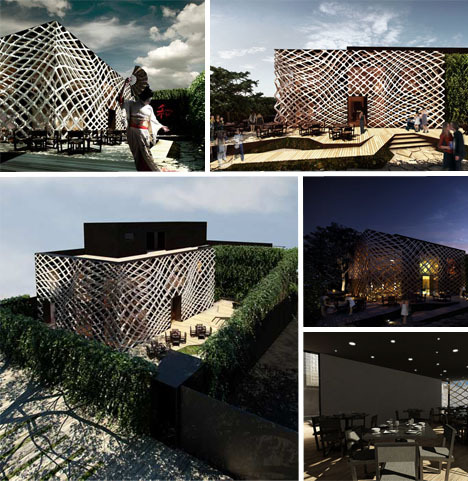 With its bi-layer steel lattice exterior offering a practical yet highly dynamic way to repurpose what was previously an old house, Tori Tori Restaurant – located in Mexico City – is the exciting result of a collaboration between industrial designer Hector Esrawe and Rojkind Arquitectos. Filtered light streams through its open air pattern and into the perimeter of the very successful Japanese eatery, creating what seems to be an organic yet structured representation of the surrounding ivy-covered walls. This is one of those stop-and-stare structures that easily demonstrates that the days of cookie cutter box designs are fortunately over and done with – good riddance! 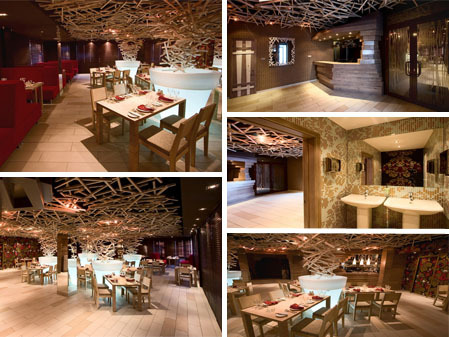 Without its chaotic cacophony of criss-crossed wooden pieces streaming from four central cores and emanating up onto the ceiling, Sliver restaurant might easily be relegated to the ranks of attractive, modern dining spaces that are nevertheless easily forgettable at the end of the day. Fortunately, Russian based Dark Design Group exceeds our wildest design expectations with their simple yet incredibly compelling effect…as if a turbulent tornado of stripped trees is swirling overhead. Just be sure to shield your dinner plate from the splintery fall-out!